The IT sector lures various individuals and organizations who wish to join the rising tide of progress. The industry experts have pretty high salaries, create mind-blowing things like blockchain-based systems, and make the world more innovative and comfortable. With the rising requirements for constantly changing and growing, companies can hardly handle all process in-house, so the idea of IT outsourcing basic concept becomes more and more popular. 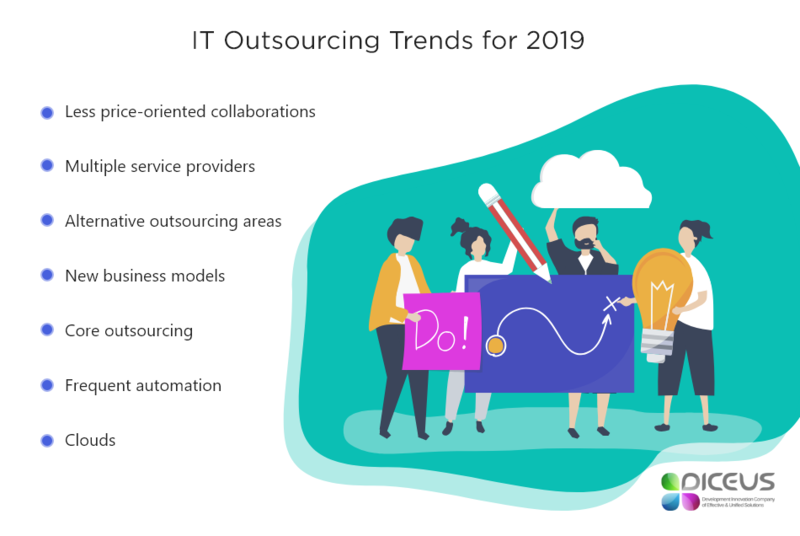 The GSA survey revealed that 70% of companies plan to outsource more processes by 2020 and 84% of the respondents think that the IT outsourcing industry will grow. Technavio also predicts the market growth to $409 billion by 2022 with the CAGR of over 4%. These numbers are quite tenable as the world reshapes while boundaries between hired developers and technology partners blur. Simultaneously, Statista indicates that the global size of delegated services was $85.6 billion in 2018 but there isn’t any stable uptrend. That’s why we are going to highlight the most important features of these IT services, check examples like IT outsourcing basic concept in SCM, and reveal how you can delegate processes efficiently. Starting from the very basics, let’s figure out what outsourcing and, specifically, IT outsourcing mean. According to Techopedia, the first term stands for practice when outside companies or individuals take certain processes from another business. Thus, your own employees can focus on other things, free some time, and rest which lead to cutting costs and expenses. Outsourcing is wonderful because the corporation is able to do core functions without wasting resources on minor tasks. Respectively, IT outsourcing basic concept refers to the same practice but in the single specific industry of Information Technology. Enterprises can hand over anything by delegating to subcontractors stuff like software development, database-related processes, customer support, and so on. Usually, IT corporations contract with freelancers or teams from countries with lower costs. Also, there may be high-level outsourcing when enterprises sign deals with equal partners and send them core tasks. In this case, it’s value-added outsourcing. Offshoring. Means, transferring tasks to far overseas country. Helps to cut costs, avoid high taxes, and enter the area with the more loyal economic climate. Nearshoring. Moves business processes to any near state, often, a neighborhood one. It’s more convenient if you need to control things personally. Homeshoring. Delegates anything to local teams. In addition, this type stands for the at-home working of your company’s employees. Apart from these categories, there are functional ones like BPO (sending the entire processes like support or HR), co-sourcing (when the company delegates literally everything instead of one or two functions), and multi-sourcing (during which one customer cooperates with several teams under one contract). Read our article to get more info about software development outsourcing. Separately, we would like to talk about IT outsourcing basic concept in SCM. Supply chains benefit from Information Technology because modern developers can facilitate every stage. For instance, eCommerce digitizes a lot of minor functions and reduces expenses when ERP tools introduce the total integration, so different parties can access a single database. Our company outsources ERP systems and other IT functions to boost the profitability of your supply chain or any other business. 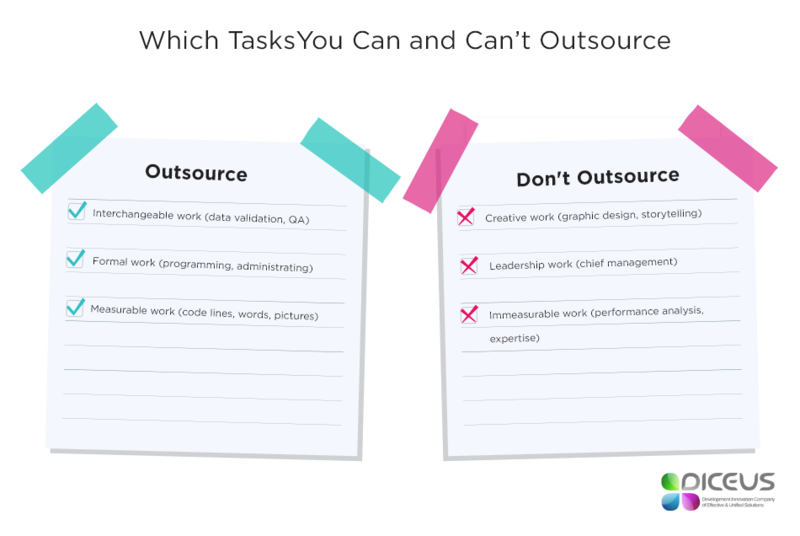 To make it clear, let’s compare similar processes and tasks which can and can’t be outsourced. Generally, you can delegate interchangeable routine work like data validation or QA but you can’t do it with unique and creative activities like graphic design or storytelling. Then, you can pass on jobs which require formal knowledge (programming, testing) but not the ones with advanced skills (chief management). As well, any measurable things can be transferred to other departments but don’t outsource work you can’t measure because then you will not be able to evaluate the performance of partners properly. Finally, the golden rule of IT outsourcing basic concept states: never redistribute processes which are strongly connected to other in-house stuff. It’s always better to do linked things under one roof to avoid potential miscommunications and further expenses on fixing. Well, now it should be clear how outsourcers work. If you consider diversifying your business, it’s better to specify needs, wished, and goals before delegating. Firstly, set global tasks and divide them into smaller ones, so you will see which things are unnecessary and which are core, instead. Obviously, leave key stuff in your main facility because your team should focus on the most important points. Minor ones can be passed on, respectively. However, if you are not sure about the deal, look at IT outsourcing examples of advantages and disadvantages. Lower costs. The correctly chosen overseas partner will have significantly lower prices for labor, equipment, and various services like hosting or maintaining. Proper qualification. Again, good outsource companies are experienced enough to deliver the best level of expertise or work itself. Sometimes, they are better than your in-house employees and strategies. On-project workers. With delegated jobs, you can freely get and release extra resources (either human or material ones) for occasional tasks. Possible pitfalls. Without costly control, untrusted teams can fail to meet your requirements or ask for insane compensation. Other time zones. While cooperating with far companies, you should be ready for more complicated coordination and mismatched workflows. Cultural and language issues. They make clear explanations nearly impossible. Combined with the previous point, this one may result in longer development time. In general, this year will feature partnerships between various teams and enterprises because clients will look for innovation-friendly vendors. Companies focused on the needs of customers and the final result will succeed, for sure. Needless to say that our staff follows this strategy by declining hourly rates, implementing full-stack development process with BA and QA, and providing guarantees of in-time deployment of the product. Less price-oriented collaborations. All parties will focus on value instead of price. Obviously, costs are important but they are not definitive no more. Multiple service providers. With growing needs in industry-specific knowledge and skills, clients tend to choose several specialized companies. Alternative outsourcing areas. We can expect more interest in developers from Central and Eastern Europe, particularly, from Ukraine. New business models. As partners will share the responsibility for the result, new outcome-based contracts will appear and notice periods will shorten. Core outsourcing. Respectively, with the increased trustworthiness, partners will outsource not only minor tasks but key processes, too. Frequent automation. Bots, robots, AI, and virtual helpers are useful already. In the future, they will become skilled enough to handle a lot of IT tasks. Additionally, there’s another noteworthy trend which affects more companies as they tend to evolve into technology partners instead of simple executors. For example, our team doesn’t position itself as an outsourcing company because we create unique solutions which help customers to achieve their goals. Furthermore, we don’t sell hours, we sell results. With a solid expertise, our staff can define what your business needs and how long it will be to deploy your customized product. As a result, you get a perfectly corresponding working app exactly in time. As a conclusion, here are some insights on singing your first contract with a freelance outsourcer. Firstly, remember your needs and look for a person or a team which will match perfectly. A single qualified worker is wonderful for handling one or two tasks but you will definitely want a group of experts for complicated processes. Individual outsourcers and small teams are widely presented on Upwork, Easy Outsource, and Guru. In the same time, large providers who accept various IT outsourcing examples have their own platforms and feature negotiable prices. If you are looking for a partner, check the list of 10 outsourcing companies in Europe. Considering the aforementioned trends, you may want to find a trusted company which outsource projects properly, realize the risks and responsibility, provides key services like analysis or support, and knows all your wishes. Here we are. Following the idea of IT outsourcing basic concept, we adopt the most innovative approaches to meet the customers’ needs and deploy perfect products. Our teams feature full-cycle development with minimum risks and great usability of the final product. Contact us now to discuss your requirements, so we will care about a single minor task or the primary core process.